1. Marvel’s new Avengers movie rocks!!! ! Yeah, I know, deep thoughts from my world. I don’t want to ruin the movie for anyone who has not seen it, but I think that at this point of the weekend, you may be in the minority if you have NOT seen it yet. I believe that I read on the internet that it had the second best opening weekend EVER. (And I read that sometime on Saturday). So yeah, I saw a 10:15 am showing on Friday (my vacation day), which is kind of “crazy”, but it was to accommodate my friends afternoon work schedules (the Avengers is 2 hours 23 minutes long, but I think that previews were like 21 minutes…..so we got out of the movie at around 1 pm, actually). For longer movies, sometimes I wish there was an intermission, because you hate to get up and miss anything in the movie in order to run to the restroom or get a popcorn refill. I polished off my kid’s meal popcorn during the previews (it’s small), and the movie theatre that I was at gives free popcorn refills, but I didn’t want to miss the movie, so it was hard to take advantage of that exceedingly cool facet. Anyways, it was quite fun to be one of the first of American audiences to view The Avengers, unless you were one of the mass of humanity at the midnight showings around the country. I loved Joss Whedon’s (of Buffy the Vampire Slayer fame) directing of The Avengers. He directed it with a human side, which I appreciate immensely, and the interpersonal focus on the characters and their interactions was 100% compelling. There is an article on Joss and his directing and The Avengers in my new May 2012 issue of Wired magazine. The article talks about ‘The Whedon Way”, and I completely saw the part about how Whedon’s characters are quite aware of their own weaknesses and strengths, and they are good at voicing them. Whedon is quoted as saying, “It’s a flaw in my work that is enough of a virtue that I let it slide” and “I make people ridiculously self-aware because I hate deception.” (May 2012 Wired magazine, page 175). There was such a depth to the characters of The Avengers, and it was interesting to see the nitty-gritty human side that is often left out of action movies, or under-valued and under-developed in favor of explosive special effects and all the bells and whistles. I found myself appreciating the differences of personality and giftedness of all the characters, and I saw the theme and importance of unity in order to come together and accomplish great things. “No man (or woman) is an island”, as the old saying goes, and you know what? It is true. Even the Lone Ranger had Tonto. Once the Avengers stopped fighting amongst themselves, then they were able to become a team and achieve the hopes and objectives that Nick Fury has for them. Also, a human emotional piece in the Avengers that stood out to me was that I saw how Natasha (a.k.a. Black Widow) was somewhat tormented by her past….wanting to erase the “red in her ledger” (as she kept saying at one point of the movie) and obtain a clean slate. A clean slate is so liberating and so freeing. Who among us hasn’t desired that at one point of our lives? I think that is the importance of grace (and, because of my faith beliefs, I think that is the importance of Jesus, redemption, and forgiveness). This world that we are all a part of is not one that promotes grace, and that old song “What have you done for me lately?” (Jodi Whatley?) rings true in our perfomance-oriented, hurried, and score-card keeping American society. I can preach to the choir sometimes, and this topic of grace is one that I am still learning, with scraped knees and frustration with myself (and others) along the way. Also, I need to point out that while I can appreciate characters like Captain America, and his unwavering focus on bravery, rules, and always doing the right thing, and I enjoy Hawkeye’s talent for bow and arrow (he and Katniss Everdeen are single-handedly helping the old school bow and arrow make a comeback), however, I found myself appreciating more the strengths of Tony Stark (a.k.a. Iron Man) and seeing a new side of him in this movie. Honestly, I didn’t see the first Iron Man movie (just the second one), so this may not be a perfect synopsis or character representation, but from what I can tell (and from his own self-awareness, a.k.a Joss Whedon style), he can be brash, cocky, self-absorbed, and brilliant (and he knows it), but he also has many other sides that are beautiful. He really comes full circle when he realizes the importance of unity and working with others. He has so much to bring to the table: such strength, smarts, a philanthropy spirit….and in the end he is noble and brave and willing to sacrifice for a cause he cares about. Quite beautiful, indeed. Well, I had a few others things that I have pondered lately, but I am actually going to leave this post just with my personal thoughts on the Avengers. I think that anything else would lesson what I feel led to say, and my other ponderings may just be future posts for another time, or my own introspective musings and self-awareness. You can just call me the Starbucks Promotion Girl. I absolutely LOVE Starbucks. 1. I register my Starbucks gift cards. I love the Starbucks gift card free rewards program, and I am on the green star level currently where added syrups are FREE (If my middle name wasn’t Anne, then I think that it would be free. LOL). 2. My family knows that if they buy me a gift card for Christmas or my birthday, then one of the top gift cards is ALWAYS Starbucks. I recently had a first for me- I reloaded my Starbucks gift card, because over time I had burned through the 3 or 4 gift cards that I had (like I said, everyone knows that I love Starbucks). I reloaded the gift card with some money that I had gotten back on my tax return. Strategically budgetted in, of course. That is my financial situation, honestly, but all is well. 3. Last week, I went with my friend to this Working Women’s Expo in my city where thousands of women attended. I was largely going to find out about cool businesses and things in my area…..plus hopefully get some cool free stuff, too. Beside playing a fun plinko game (that reminded me of the Price is Right), I also played a game at a dental table where you throw the ring toss on the toothbrush. And, I missed all 3 times. Very disappointing, but I am so glad that I found a new dentist, which is the reason that I went over to the table. Anyways, the nice girl took sympathy on me, whipped out a prize, and it was a $5 Starbucks gift card. That was a beautiful surprise! 4. When I meet with friends, we often go to Starbucks. Second, a Starbucks drive-through is close to where I live, which is quite dangerous for me, especially on my way home from work. Third, at my old job, we used to sometimes have Saturday night Starbucks runs (since Starbucks was right down the street) where we would take employee orders, then one staff member would run out on a break and get all of us Starbucks. It was super fun, all of us were fans of Starbucks, and it made having to work Saturday nights (for the group of us that consistently had to work Saturday nights) much more fun. 5. One day, I think that it would be cool to own stock in Starbucks. In the future, when I have more disposeable income, it would be nice to invest in stocks and do more financial stewardship and investment. 6. When I think of Heaven, one thing that I have pondered is what while Heaven be like? It is so hard for the human mind to comprehend, you know. I want to see my name written in the book of life. I want to meet Jesus, and hear those words of honor “well done, my good and faithful servant.” And, on a much less spiritual note, I have wondered random things about Heaven, like what we will do when we are not worshipping….i.e. will we do cool stuff, like fly? I totally want to meet the saints of old, like Esther and Joshua, and I will be honored to meet people that I never got a chance to meet on earth, like Mother Teresa, who I would have loved to have met before she died. And, I have wondered if we will eat in Heaven. But, the Bible mentions eating around a table, so I think we will eat in Heaven. 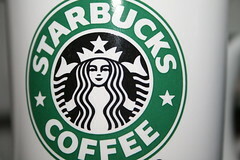 So, one small slice of Heaven for me would be my own little Starbucks where everything is FREE. Yeah, that would be super cool! 7. I have the Starbucks app on my semi-new iPhone. I believe that it is one of only five apps that I have downloaded so far. It is in a select group of the best of the best of my favorite things. I find the app quite helpful when you are looking for nutritional content of their drinks and food, when you are travelling and need to know where a Starbucks is, and hours of operation for Starbucks. They even have this cool feature for the technically hip crowd where you do not have to actually FIND your Starbucks gift card to pay, but where you just scan the code for it. Kind of cool. My friend told me about that, and it seems quite convenient. I am excited to be off work on a vacation day tomorrow. Yay for having a three day weekend! I have a list of home stuff to catch up on, but I also organized a friend group that is going to see a matinee showing of Marvel’s The Avengers tomorrow. I have been eagerly waiting to go see The Avengers for months now, and this weekend it is opening in the American movie market. It is supposed to be THE Blockbuster of the summer, and it has been smashing world records in the overseas market left and right, from what I hear (according to TheWrap.com and other internet sites). I definitely like superhero movies (and action movies in general), and I am completely inspired by examples of bravery and courage in film and in life. 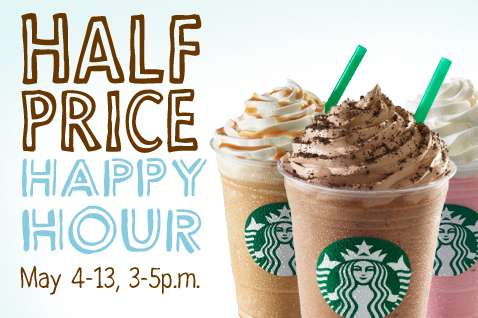 But, then of course, sometime between 3-5 pm, I plan to go to Starbucks for the Happy Hour. Woohoo!! !